ANNIE is a gadolinium-doped water Cherenkov detector performing measurements in the Booster Neutrino Beam (BNB) at Fermilab in Batavia (Illinois) in the United States. The primary goal is the determination of the neutron multiplicity generated by muon neutrino interactions in water as a function of the momentum transfer: The results will impact the reconstruction of neutrino interactions in long-baseline oscillation experiments but also the search for proton decay and the Diffuse Supernova Neutrino Background in future large-scale detector. The use of gadolinium-doped water as neutrino target in ANNIE greatly enhances the neutron detection efficiency compared to a normal Water Cherenkov detectors and is vital for a precise measurement of the final neutron number. 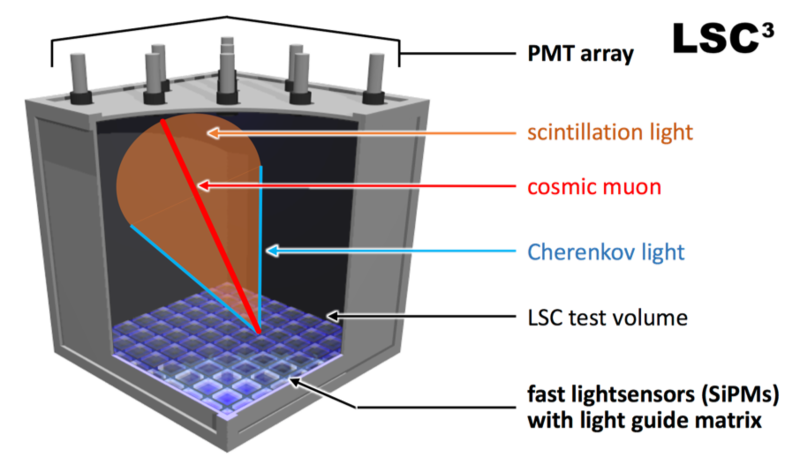 Furthermore, the experiment utilizes state-of-the-art technology to enhance its vertex and track reconstruction capabilities: Large Area Picosend Photodetectors (LAPPDs) allow the reconstruction of picosecond-timing of single photons whilst simultaneously allowing for sub-cm position resolution within the 20cm x 20cm detection area. 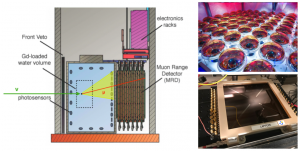 ANNIE successfully demonstrated its general concept during phase I in 2016 and 2017, where the backgrounds of the experiment have been evaluated carefully with a smaller detection volume prototype. Phase II will begin data-taking in January 2019 and provide the first physics data. The involvement of the Mainz group focuses on the development of reconstruction algorithms and monitoring software for ANNIE Phase II. In parallel, we are conducting preparative studies for the subsequent Phase III, in which an acrylic vessel containing Water-based Liquid Scintillator (WbLS) will be placed within the ANNIE. 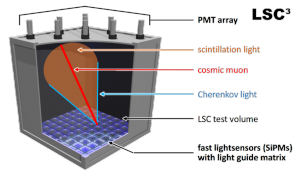 This new scintillator technology provides the unique possibility of detecting Cherenkov light and scintillation light at the same time, which will be of special interest for rare event searches such as proton decay and the detection of the Diffuse Supernova Background (DSNB) in future kiloton-scale WbLS detectors. The successful implementation of WbLS in ANNIE will thus serve as an important benchmark for future planned neutrino Long Baseline projects such as THEIA. The Mainz group will focus on laboratory measurements for the characterization of WbLS properties, including a cubic WbLS test cell to study Cherenkov/scintillation separation with ultrafast light sensors. Moreover, we will perform simulations to determine the optimal configuration of the WbLS volume within the ANNIE setup. Please contact Prof. Dr. Michael Wurm for Bachelor, Master and PhD theses.